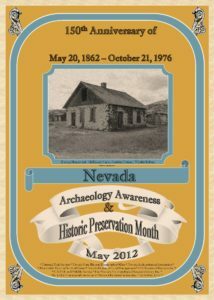 NAA has been proud to both help fund and develop the Nevada Archaeology Month Posters for the last 20 years. 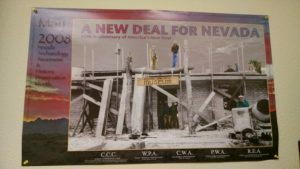 Often these coincided with the NAA’s Annual Meeting Theme or celebrated an anniversary within Nevada history and culture. We don’t quite have all of the posters updated just yet to the site but below you will find some from the last several years. 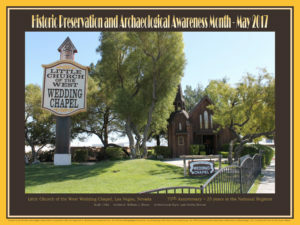 For more information about Sponsoring an Event in May during Historic Preservation & Archaeology Awareness Month please visit the Nevada SHPO’s website. 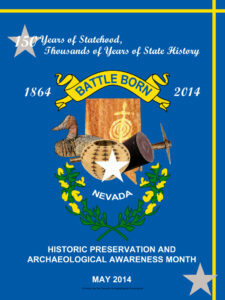 Nevada became the 36th state in the United States of America on October 31, 1864. 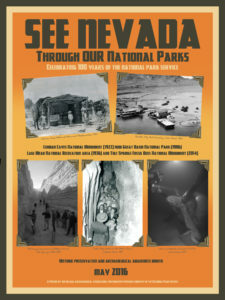 Thousands of years ago, mammoths, camels, sloths, and even lions roamed the Las Vegas Valley. 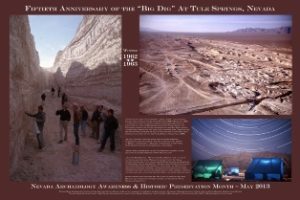 October 1962 to February 1963, a massive excavation involving extensive bulldozer trenches was conducted by a team of 30 scientists from New York, Nevada, and California. The thirty scientists were hoping to uncover the secrets of these Ice Age animals and the early people who may have lived alongside them. The project was also picked by Willard Libby to field test the Carbon-14 dating technique for which he won the Nobel Prize in Chemistry in 1960. “The Thousand Creek Ranch was initially part of the extensive holdings of William K. Ebeling who arrived in the area by 1890 (Humboldt County Assessor: Land Assessments 1890). Ebeling and his mother, Johanna Sophia settled on a parcel near the confluence of Thousand Creek and Virgin Creek in the northern end of Virgin Valley (Homestead Patent 04991). The Ebeling’s immigrated to the United States from Germany in 1871, when William was only 12 years old (United States Census Bureau, 1902). 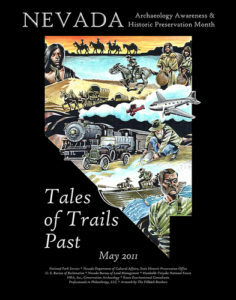 t hired men, sometimes with families, and stationed them at both Thousand Creek Ranch and McKinney Camp (Pinger 1985). 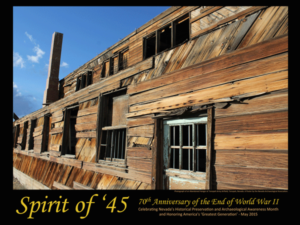 It appears that construction at the three ranches probably occurred between about 1900 and 1910.